Perfect Gift Church Flyer Template, created with Photoshop, is for Christmas Sermons. dealing with the Perfect Gift Of Christmas which is Jesus Christ. The topic can be changed to any theme dealing with gift, thanksgiving, or childhood. 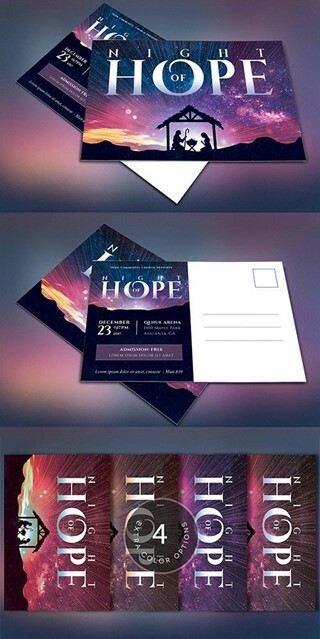 Use it as a marketing invitation for church sermons or birthday parties. The vintage colors combined with an interesting typographic composition, gives it a unique appeal that will attract your target audience. Make this postcard part of your church marketing plan. This is a Photoshop template designed by Godserv to be edited with Photoshop CS3 and higher. Once you have downloaded this template, use Adobe Photoshop CS3 or higher to make edits.